Kepco has introduced options to the standard 100W, 200W, 400W, and 1KW BOP models for driving inductive loads. The L Option (for 100W, 200W and 400W) make the BOP more suitable for a wide variety of applications such as motor testing, testing of magnetic components (coils, speakers, etc. ), industrial applications with inductive loads, driving CRT coils, cryogenic applications and powering correcting magnets for medical imaging applications or particle accelerators. The GL Series for BOP 1KW has been optimized for exceptionally low current ripple and noise and improved stability (drift and temperature), making them ideal for driving inductive loads such as large magnets or motors. 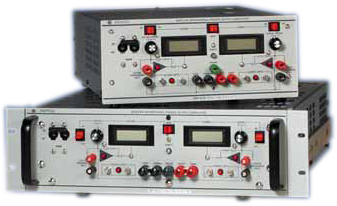 These bipolar power supplies pass smoothly through zero without switching to provide true ± voltage and ± current. Operate in Current or Current Limit Mode for loads up to 1 Henry. Also stable with any R-L series load combination. Isolated analog control standard on all models. Bipolar d-c power, 40 Watts. Preamplifiers for summing and scaling arbitrary input signals. Voltage and current stabilization with automatic crossover to current and voltage limits. Remote programming of voltage, current or both channels by external analog volage. Kepco's SN 488 Digital Programmer facilitates digital programming via GPIB interface.